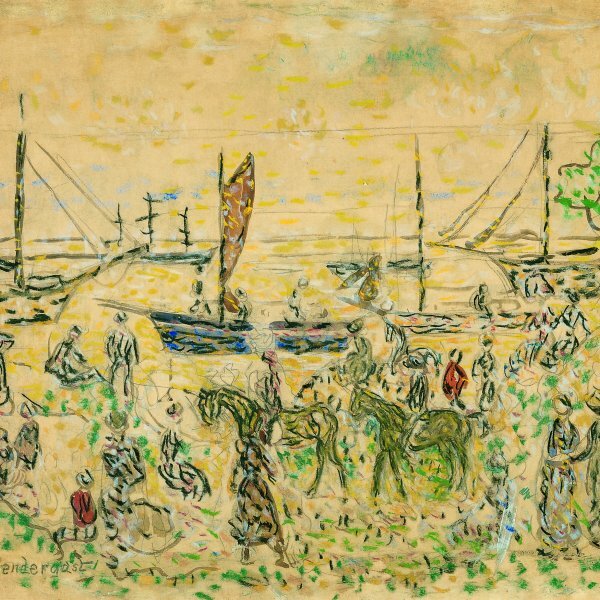 In a letter written shortly before his death the artist recalled that he spent most of his summers "along the New England coast-Annisquam, Gloucester and Provincetown. Of late years I have been going to the Maine coast." To the list of places visited along the eastern coastline of the United States, Potthast might have added Noank, Connecticut, on the Mystic River, where he also sketched and is probably the subject of this painting. 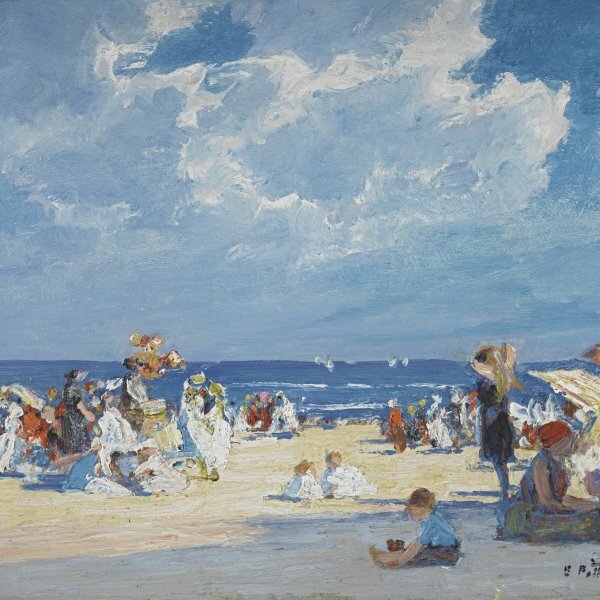 Potthast's paintings along the northern shoreline of the United States are markedly different from his joyful scenes of New York City's beaches. Often they are of the ocean breaking upon the rocky shore, reminiscent of Winslow Homer's titanic images of the forces of water against land. Occasionally, they show isolated figures looking out to sea. 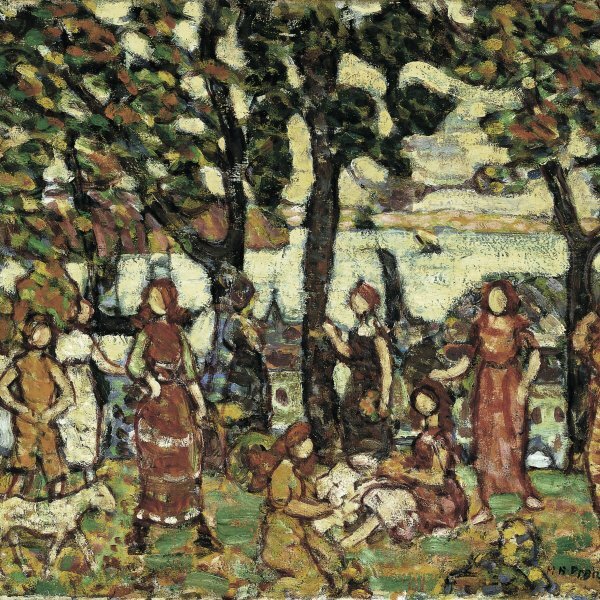 Along the Mystic River recalls several of the artist's views of Gloucester in which he uses a foreground ledge leading into the composition. Boats or buildings usually frame the format. The tonal mood of the distant boat and shore brings to mind Whistler's nocturnal views of the Thames. A silhouetted foreground figure gazing across the water contributes to the haunting beauty of the painting which is boldly constructed, yet evokes the transient quality of human existence. 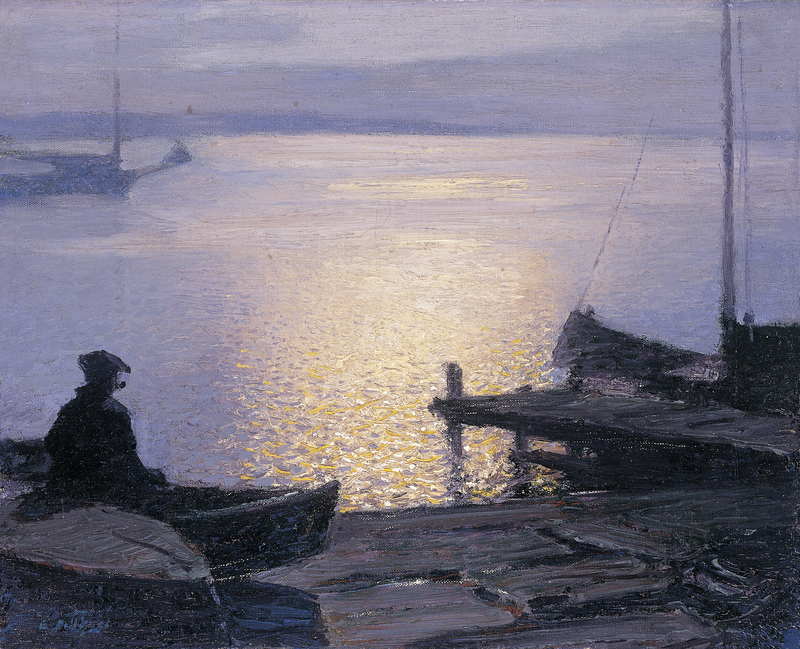 Although he fell under the influence of the French Impressionists while in Europe, the dazzling staccato effect of the reflection of the sunset breaking into a neo-Impressionist pattern upon the water is almost unique in Potthast's work. Impasto strokes of white, yellow, and orange light contrast with the cool lavender tones of the water. Along the Mystic River was included among the paintings shown at the Grand Central Galleries shortly before the artist's death. Although the exhibition was widely advertised, it received little critical attention. A day after the show had closed, the artist suffered a heart attack and was found dead in his studio. "Surrounded by more than five hundred of his paintings, " one newspaper reported, "he lay in front of his easel, as if he had been stricken while at work." Another newspaper reported the following day that "shortly after artist friends in the building-the Gainsborough Studios-had taken charge, men from the Grand Central Galleries returned the thirty paintings the artist had had on exhibition during the last two weeks at that place." If the artist's estate consisted of five hundred paintings, as several newspapers asserted, their value was placed from only seventy-five to eighty-five thousand dollars.